AUSTIN, Texas--(BUSINESS WIRE)--Jul. 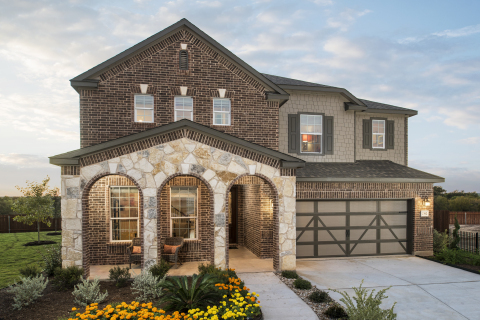 20, 2018-- KB Home (NYSE: KBH) today announced the grand opening of Meadows at Clearfork, a commuter-friendly collection of new homes in Lockhart. Easily accessible via U.S. Route 183 or Texas State Highway 130, the new community is convenient to Downtown Austin. Located in the well-established neighborhood of Lockhart, home to landmark buildings, dining establishments and the official Barbecue Capital of Texas, the KB homes at Meadows at Clearfork are close to several recreational facilities, including Maple Street Park and Lockhart Soccer Complex. Nearby Lockhart State Park features a golf course, hiking and biking trails, campsites and a historic recreation hall. Lockhart Junior High School is within walking distance. KB Home will host a grand opening celebration Saturday, July 21 from 10:00 a.m. to 7:00 p.m. and Sunday, July 22 from 11:00 a.m. to 7:00 p.m., during which attendees may tour the two elegantly appointed model homes. Additionally, refreshments and family entertainment will be provided on Saturday between 12:00 p.m. and 4:00 p.m. KB homebuyers at Meadows at Clearfork may choose from 14 one- and two-story floor plans that range in size from 1,400 to 2,800 square feet and include up to six bedrooms and four baths. Among the desirable design features characteristic of all the homes at Meadows at Clearfork are open kitchens, spacious great rooms and dedicated laundry rooms. Pricing begins in the low-$200,000s. The KB homes at Meadows at Clearfork will be built to current ENERGY STAR® guidelines and include WaterSense® labeled faucets and fixtures, meaning they are designed to be more energy- and water-efficient than most typical new and resale homes available in the area. These energy- and water-saving features are estimated to save homebuyers between $804 to $1,284 a year in utility costs, depending on floor plan. The KB Home sales office at Meadows at Clearfork is located at 602 Indian Blanket Street in Lockhart and is open Mondays through Thursdays from 10:00 a.m. to 6:30 p.m., Fridays from 12:00 p.m. to 7:00 p.m., Saturdays from 10:00 a.m. to 7:00 p.m. and Sundays from 11:00 a.m. to 7:00 p.m. For more information about the KB homes at Meadows at Clearfork or KB Home’s other new home neighborhoods, visit www.kbhome.com or call 888-KB-HOMES. KB Home (NYSE: KBH) is one of the largest homebuilders in the United States, with more than 600,000 homes delivered since our founding in 1957. We operate in 35 markets in seven states, primarily serving first-time and first move-up homebuyers, as well as active adults. We are differentiated in offering customers the ability to personalize what they value most in their home, from choosing their lot, floor plan, and exterior, to selecting design and décor choices in our KB Home Studios. In addition, our industry leadership in sustainability helps to lower the cost of homeownership for our buyers compared to a typical resale home. We take a broad approach to sustainability, encompassing energy efficiency, water conservation, healthier indoor environments, smart home capabilities and waste reduction. KB Home is the first national builder to have earned awards under all of the U.S. EPA’s homebuilder programs — ENERGY STAR®, WaterSense® and Indoor airPLUS®. We invite you to learn more about KB Home by visiting www.kbhome.com, calling 888-KB-HOMES, or connecting with us on Facebook.com/KBHome or Twitter.com/KBHome.